Did you know how important Great Yarmouth medics were in WW1? Did you know we have some local, unsung, heroes? One stand-out individual was Marion Sabina Barwell, who worked as Matron at Great Yarmouth General Hospital. She was called up for war nurse duties in 1915 and served in France during WW1. 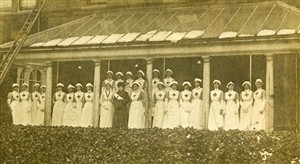 Marion was awarded the Royal Red Cross – the highest award for nurses. Back in Great Yarmouth, Miss Docherty, the night sister, took over as Matron, while Marion was in France. In January 1918, after a bombardment on the town, Miss Docherty remarkably treated seven injured locals and worked through the night with her staff to save as many as possible. By morning, the hospital was almost unrecognisable from the chaos of the previous night – with everything running smoothly and successfully once more. These are just two of the unsung heroes we have from Great Yarmouth.